Methylosome subunit pICln is a protein that in humans is encoded by the CLNS1A gene. ↑ Anguita J, Chalfant ML, Civan MM, Coca-Prados M (Apr 1995). "Molecular cloning of the human volume-sensitive chloride conductance regulatory protein, pICln, from ocular ciliary epithelium". Biochem Biophys Res Commun. 208 (1): 89–95. doi:10.1006/bbrc.1995.1309. PMID 7887970. ↑ Nagl UO, Erdel M, Schmarda A, Seri M, Pinggera GM, Gschwentner M, Duba C, Galietta LJ, Deetjen P, Utermann G, Paulmichl M (Mar 1997). "Chromosomal localization of the genes (CLNS1A and CLNS1B) coding for the swelling-dependent chloride channel ICln". Genomics. 38 (3): 438–41. doi:10.1006/geno.1996.0651. PMID 8975725. ↑ "Entrez Gene: CLNS1A chloride channel, nucleotide-sensitive, 1A". ↑ Larkin D, Murphy D, Reilly DF, Cahill M, Sattler E, Harriott P, Cahill DJ, Moran N (Jun 2004). "ICln, a novel integrin alphaIIbbeta3-associated protein, functionally regulates platelet activation". J. Biol. Chem. 279 (26): 27286–93. doi:10.1074/jbc.M402159200. PMID 15075326. 1 2 3 Friesen WJ, Paushkin S, Wyce A, Massenet S, Pesiridis GS, Van Duyne G, Rappsilber J, Mann M, Dreyfuss G (Dec 2001). "The methylosome, a 20S complex containing JBP1 and pICln, produces dimethylarginine-modified Sm proteins". Mol. Cell. Biol. 21 (24): 8289–300. doi:10.1128/MCB.21.24.8289-8300.2001. PMC 99994 . PMID 11713266. ↑ Krapivinsky G, Pu W, Wickman K, Krapivinsky L, Clapham DE (May 1998). "pICln binds to a mammalian homolog of a yeast protein involved in regulation of cell morphology". J. Biol. Chem. 273 (18): 10811–4. doi:10.1074/jbc.273.18.10811. PMID 9556550. ↑ Friesen WJ, Wyce A, Paushkin S, Abel L, Rappsilber J, Mann M, Dreyfuss G (Mar 2002). "A novel WD repeat protein component of the methylosome binds Sm proteins". J. Biol. Chem. 277 (10): 8243–7. doi:10.1074/jbc.M109984200. PMID 11756452. Calinisan V, Gravem D, Chen RP, Brittin S, Mohandas N, Lecomte MC, Gascard P (2006). "New insights into potential functions for the protein 4.1 superfamily of proteins in kidney epithelium". Front. Biosci. 11: 1646–66. doi:10.2741/1911. PMID 16368544. Buyse G, de Greef C, Raeymaekers L, Droogmans G, Nilius B, Eggermont J (1996). "The ubiquitously expressed pICln protein forms homomeric complexes in vitro". Biochem. Biophys. Res. Commun. 218 (3): 822–7. doi:10.1006/bbrc.1996.0146. PMID 8579598. Schwartz RS, Rybicki AC, Nagel RL (1997). "Molecular cloning and expression of a chloride channel-associated protein pICln in human young red blood cells: association with actin". Biochem. J. 327 (2): 609–16. PMC 1218836 . PMID 9359436. Bekri S, Adélaïde J, Merscher S, Grosgeorge J, Caroli-Bosc F, Perucca-Lostanlen D, Kelley PM, Pébusque MJ, Theillet C, Birnbaum D, Gaudray P (1998). "Detailed map of a region commonly amplified at 11q13→q14 in human breast carcinoma". Cytogenet. Cell Genet. 79 (1–2): 125–31. doi:10.1159/000134699. PMID 9533029. Krapivinsky G, Pu W, Wickman K, Krapivinsky L, Clapham DE (1998). "pICln binds to a mammalian homolog of a yeast protein involved in regulation of cell morphology". J. Biol. Chem. 273 (18): 10811–4. doi:10.1074/jbc.273.18.10811. PMID 9556550. Tang CJ, Tang TK (1998). 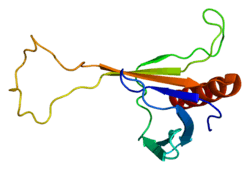 "The 30-kD domain of protein 4.1 mediates its binding to the carboxyl terminus of pICln, a protein involved in cellular volume regulation". Blood. 92 (4): 1442–7. PMID 9694734. Pu WT, Krapivinsky GB, Krapivinsky L, Clapham DE (1999). "pICln inhibits snRNP biogenesis by binding core spliceosomal proteins". Mol. Cell. Biol. 19 (6): 4113–20. PMC 104370 . PMID 10330151. Hubert MD, Levitan I, Hoffman MM, Zraggen M, Hofreiter ME, Garber SS (2000). "Modulation of volume regulated anion current by I(Cln)". Biochim. Biophys. Acta. 1466 (1–2): 105–14. doi:10.1016/S0005-2736(00)00177-2. PMID 10825435. Friesen WJ, Paushkin S, Wyce A, Massenet S, Pesiridis GS, Van Duyne G, Rappsilber J, Mann M, Dreyfuss G (2001). "The methylosome, a 20S complex containing JBP1 and pICln, produces dimethylarginine-modified Sm proteins". Mol. Cell. Biol. 21 (24): 8289–300. doi:10.1128/MCB.21.24.8289-8300.2001. PMC 99994 . PMID 11713266. Meister G, Eggert C, Bühler D, Brahms H, Kambach C, Fischer U (2002). "Methylation of Sm proteins by a complex containing PRMT5 and the putative U snRNP assembly factor pICln". Curr. Biol. 11 (24): 1990–4. doi:10.1016/S0960-9822(01)00592-9. PMID 11747828. Friesen WJ, Wyce A, Paushkin S, Abel L, Rappsilber J, Mann M, Dreyfuss G (2002). "A novel WD repeat protein component of the methylosome binds Sm proteins". J. Biol. Chem. 277 (10): 8243–7. doi:10.1074/jbc.M109984200. PMID 11756452. Meyer G, Rodighiero S, Guizzardi F, Bazzini C, Bottà G, Bertocchi C, Garavaglia L, Dossena S, Manfredi R, Sironi C, Catania A, Paulmichl M (2004). "Volume-regulated Cl− channels in human pleural mesothelioma cells". FEBS Lett. 559 (1–3): 45–50. doi:10.1016/S0014-5793(04)00020-1. PMID 14960305. Larkin D, Murphy D, Reilly DF, Cahill M, Sattler E, Harriott P, Cahill DJ, Moran N (2004). "ICln, a novel integrin alphaIIbbeta3-associated protein, functionally regulates platelet activation". J. Biol. Chem. 279 (26): 27286–93. doi:10.1074/jbc.M402159200. PMID 15075326. Fürst J, Schedlbauer A, Gandini R, Garavaglia ML, Saino S, Gschwentner M, Sarg B, Lindner H, Jakab M, Ritter M, Bazzini C, Botta G, Meyer G, Kontaxis G, Tilly BC, Konrat R, Paulmichl M (2005). "ICln159 folds into a pleckstrin homology domain-like structure. Interaction with kinases and the splicing factor LSm4". J. Biol. Chem. 280 (35): 31276–82. doi:10.1074/jbc.M500541200. PMID 15905169. Azzouz TN, Pillai RS, Däpp C, Chari A, Meister G, Kambach C, Fischer U, Schümperli D (2005). "Toward an assembly line for U7 snRNPs: interactions of U7-specific Lsm proteins with PRMT5 and SMN complexes". J. Biol. Chem. 280 (41): 34435–40. doi:10.1074/jbc.M505077200. PMID 16087681.